Home » All Forums » [Miscellaneous Forums] » Miscellaneous - Food Related » Your favorite frozen pizza ... and why? Helpful ReplyYour favorite frozen pizza ... and why? 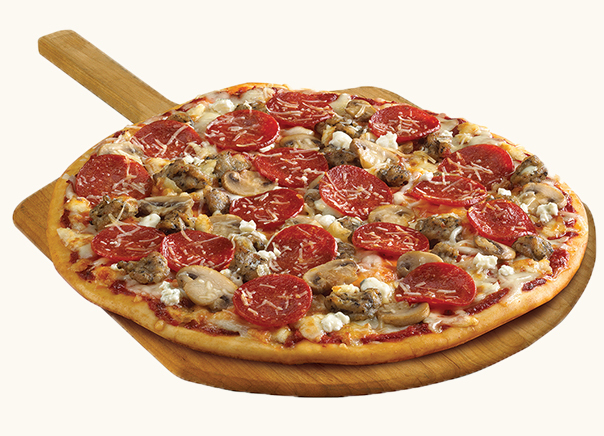 Your favorite frozen pizza ... and why? "I'm hungry. It's late. I'm tired, too tired to cook. Or leave the house. I need some calories; empty ones will do." For many, the answer has been frozen pizza, the one item that is never the "answer" so long as there is light in the day. Well, after a great deal of trials over many years I have discovered a variety that is actually "decent": Sam's Choice "Italia" varieties at Wal-Mart. So far I have tried the "Three Cheese" and the "Meat Trio". As pizza, both were decent; as frozen pizzas, they were freaking OUTSTANDING - especially the Meat Trio !!! So, as food technology constantly evolves and improves, what is your current "go to" for that desperation dinner? Honestly? I'm a sucker for those 99 cent Totino's party pizzas, the ones with the little pepperoni cubes. Has to be pepperoni, no other types will do. I sprinkle on some Parmesan from a can and some garlic salt with parsley before baking. Sometimes if I'm feeling fancy I also add some strips of American cheese and/or sliced green olives. If I'm eating frozen pizza, I want it to in no way resemble good pizza. You'll have no problem with that!!! My local Winn Dixie supermarket has started selling Pep’s Drafthaus Original frozen pizza. So far, I have only tried The 5 Meat Mash. Good stuff. "Loaded with huge chunks of Sweet Italian Sausage, Spicy Sausage, Pepperoni, Ham and Bacon layered on generous Mozzarella Cheese." I also like the Totino's Party Pizzas once in awhile. I ate a lot of them in my younger days, as a hungry teenager and as a penny-pinching new entry into the workforce. Pep's has a pretty good pedigree. I don't know if I have a clear favorite. Tombstone, Connie's and Home Run Inn are right up there, but I like to try the lesser known store brands and bar brands, too. I do like Pep's pedigree. Unfortunately, it looks like the Tombstone Tavern (or Tap) no longer exists. That would have been a good stop on a trip up North. Home run inn is my favorite. I haven't had one in ages though. Screaming Sicilian is ok as well. Plus it comes with a cardboard mustache for hours of fun. Regarding those lesser known brands, Woodman's has seemingly acres of freezer space devoted to frozen pizza and I think the majority are produced in Wisconsin. Frozen pizza may be a heretofore unknown category of Regionally Appropriate Food in the state. Oh that reminds me. I tried one a while back from Outsiders that was a Detroit style and it was good. I saw they also have a Milwaukee style which I haven't tried yet but looked pretty good. To me, all those "fancy" frozen pizzas are bland. They think they've taken real "pizza" and frozen it. They make what I call "Pizza That Is Frozen" and not "FROZEN PIZZA." Frozen Pizza revels in its crappiness. It amps up the flavor with an ingredients list of junk you probably don't want to look too closely at. It's "pizza" in the same way a Big Mac is a "hamburger" or Taco Bell is a "taco." If you suspend your disbelief, I believe you can thoroughly enjoy it for what it is. I saw those Outsiders Detroit style pizzas at Giant Eagle and bought the three-cheese one. I haven't tried it yet. I tried Pep's for the first time a couple of weeks ago when it was on sale at Lund's. It was like the Prohibition Special (pictured here), but it had no pepperoni. I thought it was OK. Didn't care for the crust. My current favorites are Home Run Inn (if I'm willing to consume that many calories based on the crust alone), or Bellatoria Ultra Thin Crust, either Roasted Vegetable or Ultimate Supreme, if not. Portesi's pizza and pizza fries. Yummy! I couldn't tell you how many years it's been since I last ate a frozen pizza. Not a huge fan of the, when there are decent pizza joints around. As I recall, the last one we had was a Home Run Inn and it was pretty good, but you got what you paid for. I have eaten the Totino's party ones and they just aren't my thing. They use imitation cheese, for cryin' out loud. I must say,though, that I used to like the pizza rolls. They weren't bad. It's been a long time for me also. When you look at the deals the chains are offering, the $/Sq-In ratio for frozen is about the same, especially for the "Super Premium" frozen pies, and the chain quality is better. There. I said it. The chain pizzas are better for the same cost.